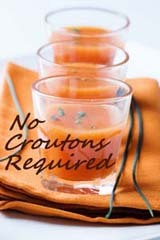 Ive looked at the No Croutons Required challenge on Jacs Tinned Tomatoes blog before, but never got around to making anything for it. When I saw that the August ingredient was lentils, I thought I would give it a go. The other stipulation is that it should be suitable for vegetarians. 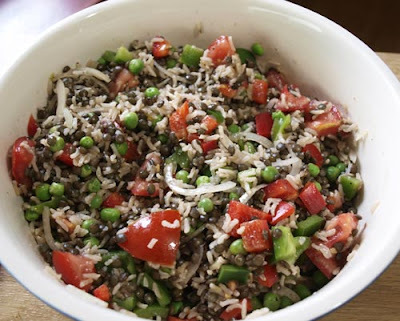 I had a bit of an internet search and found THIS recipe for Warm Pea and Lentil Salad on the Delicious Magazine website. 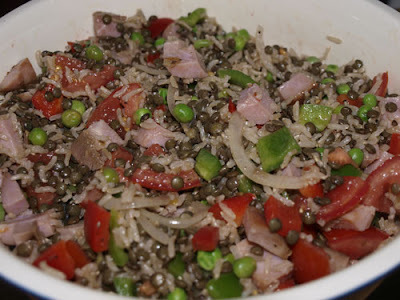 I cooked up some brown rice as well as the lentils, added a red and a green pepper, a couple of tomatoes as well as the the peas and onions in the original recipe. It would also be nice with some chopped mint through it or some feta cheese cubes. So thats the end of the vegetarian bit for the challenge but, for the carnivores amongst you, I added some cubes of cooked ham (look away Jac!). It was delicious with or without the meat and Ill definitely be making it again.